Fidel was not only a gourmet but also a bit of a gourmand. He loved food. And he let everybody know it. In fact, at least once a week he'd host a dinner party and invite friends over to impress them with his mastery in the kitchen but also at the table. This show of largesse was on top of his day job as a renowned chef at one of the city's better restaurants. But Fidel was all that and more. 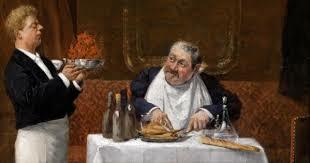 Not only could he cook up a storm but he always knew what side dishes, desserts and wines best went with his meals. Of course his friends loved Fidel and felt privileged to be invited to share in his culinary creations. So impressed, his friends pledged their troth to Fidel, promising never to eat the food of any other chef in the city. And this made Fidel very, very happy. One week, following a lavish and mouth-watering multi-course dinner and several bottles of appropriately paired wines everyone helped clear away the dishes to make room for dessert and a liqueur. When one of the diners asked what best described their relationship with their friend the chef, Betty voiced what the rest of the privileged dinners were thinking: "fidelity?" To which Fidel replied "No thanks. I think I'll just have a coffee." The prompt for Two Word Tuesday was troth/fidelity this week. If we're having coffee make mine a double-double.